and positive reviews - we appreciate your feedback. display of all that is great from the West of Scotland. fresh fish, shellfish and our own smoked products. Perfect for the barbeque or grill! garnished with mushrooms, peppers and onions. Freshly harvested from the coast of Ayrshire! Find us at your local farmers' market! you'll also find us at markets across Scotland. Amazingly fresh, locally caught shellfish. perfection by head chef Gary Brown. Also available in the Farm Shop! The Farm Shop is open every day producing our own range of locally farmed fish and meat, cured and smoked using traditional methods. We also stock a fine selection of local products crafted by the people of Ayrshire. Find out where we are, check out our online shop or come along to Fencebay Farmer's Market, held on the last Sunday of every month. There is no mistaking that ‘fresh from the sea’ Scottish seafood flavour when you dine at The Catch @ Fins Restaurant. 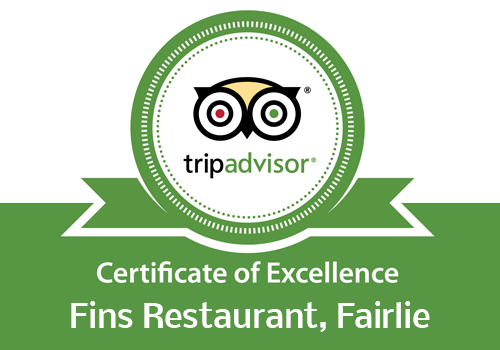 Head Chef Richard Finlay and his team prepare and serve the freshest local produce, their commitment to quality and service winning a TripAdvisor Certificate of Excellence since 2013. Read our reviews here or write your own. Specially selected, hand farmed produce from the Ayrshire coast.